Callum is one of Britain’s upcoming young driving talents, with an impressive track record in international racing. 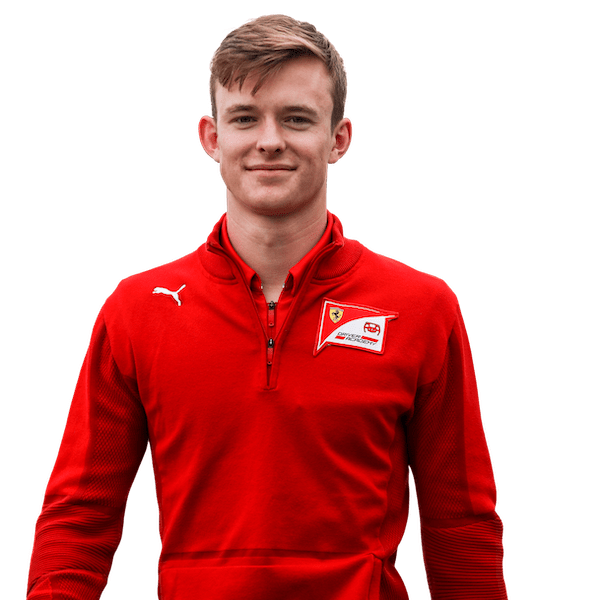 Now 20 years old, Callum was selected in late 2017 by Ferrari to join its driver development programme, the Ferrari Driver Academy. After a title-challenging GP3 campaign last year, Callum is racing with the Sauber Junior Team by Charouz in the FIA F2 Championship in 2019. Callum’s success to date originates from a strong background in international karting, commitment to a healthy, active and balanced lifestyle, hard work, mixed with some pure talent. Callum's goal is to pursue a career in the top echelons of motorsport by developing his skills on and off the track. Callum's debut in single seater racing at 16 was overseen by Dr Helmut Marko at Red Bull. He was their first ever driver to be taken straight from karting to F3 in Red Bull livery competing in the FIA F3 European Championship. His first season in cars saw him finish 12th overall of a grid of 35 seasoned drivers. In only his second season racing cars, Callum finished 6th overall in the 2016 FIA F3 European Championship. He was also the highest placed finishing British driver in the FIA F3 World Cup in November (2nd and 5th). In the 2017 FIA F3 European Championship, Callum finished 4th overall with 6 wins and 11 podiums, taking more Pole positions and Fastest Laps than any other driver. He wrapped up his 2017 F3 campaign with a win of Saturday's Qualification Race at the Macau GP/FIA F3 World Cup. For 2018, in GP3, Callum's focus was on delivering consistency, scoring two wins and a run of seven podiums in seven consecutive race weekends, challenging for the championship until the penultimate round, and finishing 3rd overall. Callum does not come from a racing background and started out for the fun of it. He had his first drive in a kart just before his 7th birthday and took his competitive novice race licence as soon as he was 8. By 12 years old he had begun to impress the international karting scene by winning the under 16s Formula Kart Stars British Championship and finishing 3rd in the German National Championship (KFJ category). He also enjoyed off track success as a member of his school choir winning the BBC School Choir of the Year and having the opportunity to sing in front of a full house at the Royal Albert Hall. At 13, in 2012, Callum dominated the international under 15s KFJ category with wins of the WSK Masters Series and the WSK Final Cup; he was runner up in the WSK Euro Series and CIK-FIA World Cup, and was the youngest ever driver to win the WSK Driver of the Year. Prior to his first season in cars, as a 15 year old Callum became CIK-FIA European Karting Champion in 2014, won the WSK Super Master Series, and finished 4th (from 32nd) in the CIK-FIA World Championship. Off track, Callum enjoys his music, sport and time with family and friends. "In racing I get most satisfaction from knowing I have given my best and it has paid off and put me on the top step of the podium. I also absolutely love what I do." "For me, 2015 has been all about learning and pushing for the best results." "In 2015, my best race result was at Nürburgring, where I qualified well and had a strong performance all weekend, ending with my 3rd place and top rookie finish." "The Nürburgring has been my favourite circuit since I was a kid, even just lapping it on the Playstation. It has a great flow and good variety of corners, from the fast sections to the chicane just before the right hander onto the start and finish. That chicane is a lot of fun,"
"Both rounds at Hockenheim were positive, but best of all I enjoyed my drive on slicks from 19th to 5th on the greasy October morning in the final race of the season. I seem to have a lot of fun in those conditions. So not a bad way to end the year, good fun and I was second Rookie home as well." "It was a difficult first season, especially coming fresh from karts and it was an exceptionally tough class in 2015. I've had some good results, and 12th overall with no car experience isn't too bad. In some cases we could have done better but it was all about learning last year and I've certainly learned a lot." "Red Bull and Carlin Motorsports have given me a great introduction to cars and I am thankful to them. Now I am moving on looking to challenge for race wins and the consistency of results required to win a Championship title. 2016 should be an interesting season and I can't wait to get back on the grid!" "My best race of 2014 was the karting World Championship in KF when I went from 32nd on the grid to finish 4th. It had been a long while since I started so far back on the grid." "My best karting win was the final round of the 2014 Europeans at my home track in the UK, PF International - it's a fantastic feeling to get it so right in front of your home crowd." "I had my first drive in a go-kart at Rye House aged 7, loved it, and have not stopped ever since. I was not from a motorsport family but I feel that I am now." "My family has been central to my racing, despite us not being from a motorsport background. They have been brilliant at finding good people to support me. When you are with good people in the right environment you can learn faster to become the best you can be. They have encouraged me to reach beyond my comfort zone and always move up another level." "My parents have been a big part of why I am where I am now. Dad has been amazing. He's a tough one, but he has helped me to learn lessons from every race result, good and bad. Mum is always positive, believing in me no matter what." "My racing hero is Michael Schumacher and I have been lucky enough to meet him more than once. I don't necessarily try to be like any of our racing idols, although there is much to learn from them. I find it works best to just be 'Callum' and be the best that I can be."